Mission: Guide a collaborative research network (CRN) to foster multicenter research and support AMSSM efforts in patient care, education, advocacy, reimbursement and sustainability of members. History: In August of 2016, the American Medical Society for Sports Medicine (AMSSM) launched the AMSSM Collaborative Research Network (CRN) to further expand its research presence within the organization and to develop lasting collaborations external to AMSSM. The mission of the CRN is to foster collaborative multisite research among our members with a goal of advancing the practice of sports medicine. Sports specialization, defined as the intense training in a single sport to the exclusion of other types of physical activity, is increasingly common during childhood and early adolescence. 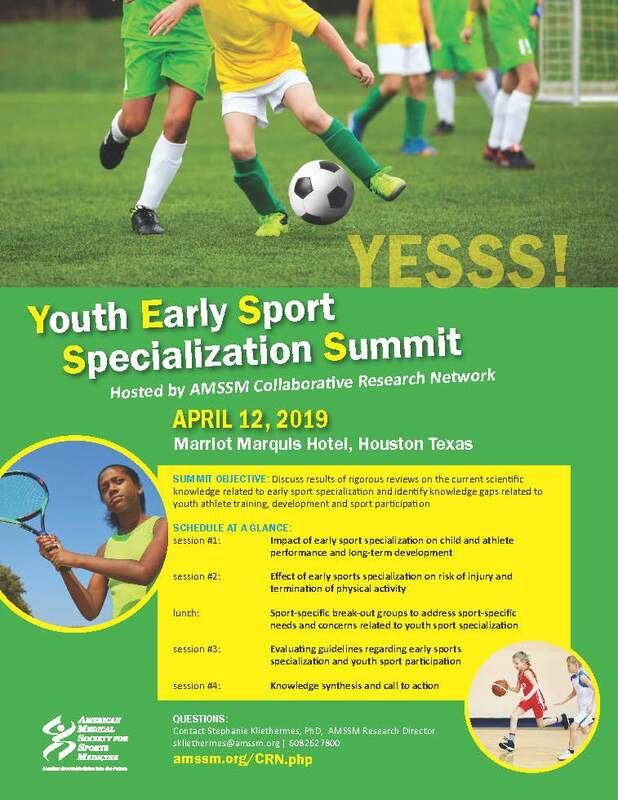 Early sport specialization may be a natural pathway for elite participation in certain individual sports that require advanced technical skills (e.g., tennis, gymnastics); however the necessity of early sport specialization in other sports is lesser known. Increasing evidence suggests a higher risk of burnout and injury among youth who specialize in a sport at a young, though limited research exists regarding potential performance benefits and long-term health of these early-specializing athletes. Advance registration is strongly encouraged and must be received by April 1, 2019. After this date, advance registration will no longer be available so attendees should plan to register on-site the morning of April 12, 2019. Please note: Registration rates increase by $50 for on-site registration. AMSSM members will be invited to sign up on the AMSSM Annual Meeting registration form. Alternatively, there will be a link available on the conference webpage for individuals (members and non-members) to register who are not attending the Annual Meeting. The cost to attend YESS! is $100 per registrant. In keeping with the mission of the AMSSM CRN, AMSSM members will receive a reduced registration fee. The CRN Advisory & Oversight Committee, comprised of thought and research leaders within AMSSM, is an important resource for the CRN Leadership Committee and essential for helping the CRN achieve its mission and initiatives. The A&O Committee regularly engages with the CRN Chair and AMSSM Research Director to stay up-to-date on progress and initiatives of the CRN. The CRN Leadership Committee, comprised of experienced and interested AMSSM member researchers, is responsible for the strategic operation and activities of the AMSSM Collaborative Research Network. The members of the CRN Leadership Committee regularly interact with each other, active members and leaders of AMSSM and those involved in the larger sports medicine community in efforts to drive forward the practice of sports medicine through CRN affiliated research and initiatives. The purpose of this RFP is to solicit research projects that will prepare a team of investigators for a competitive submission of an NIH R34 Clinical Trial Planning Grant and then to an NIH U01 Clinical Trial Implementation Grant via the National Institute of Arthritis and Musculoskeletal and Skin Diseases (NIAMS). Investigators must demonstrate preparedness and capability to eventually meet the rigor required for an NIH caliber multisite clinical trial. The topic selected for study should align with AMSSM/CRNâ€™s mission and NIAMSâ€™ scientifically supported research areas. The CRN will work closely with the investigative team to complete their initial project and to develop an R34 submission, with the ultimate goal of obtaining a U01 Clinical Trial Implementation Cooperative Agreement Award. All PIs must be active members of AMSSM; PIs from both private practice and academic institutions are encouraged to apply. Letters of intent are due June 15, 2019.